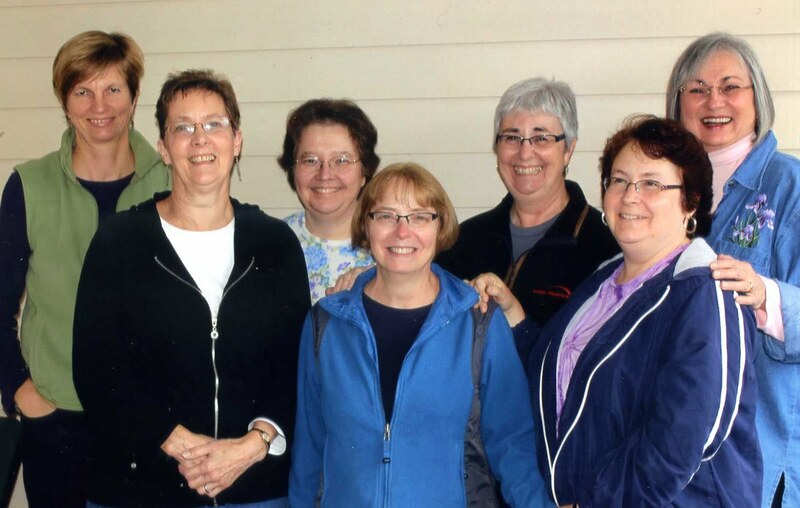 I just got home from a delicious Easter dinner at my sister's house complete with spiral ham and strawberry shortcake. Yum. Just a quick post tonight to wish every reader a happy Easter. I finished signing and addressing my Easter cards today and will mail them tomorrow. 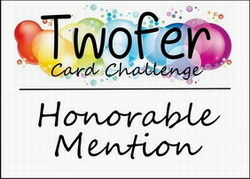 I have two cards to post today. The first was made for a little girl in town. One of my coworkers at the post office spied a letter this girl wrote to the Easter bunny and horrors it was postmarked last year! He told me that poor child had been waiting to hear from the Easter bunny for a year so I had to make her a special card. I used the tree stamps and dies from a Sizzix-Hampton Art set called Hello Spring. 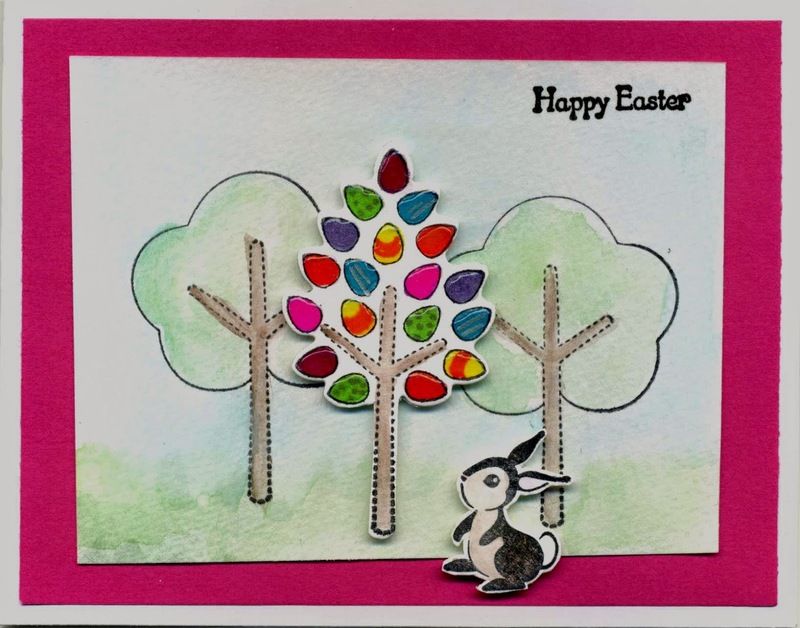 I stamped and watercolored the background trees, then colored one tree so it looked like an Easter egg tree. I covered the 'eggs' with crystal effects, added a sentiment and bunny from Stampin Up sets and mounted them on a bright card. This is the only card I finished to arrive before Easter. This next card is the one going in the mail tomorrow to the Cardologists. There is a sad story to tell here. I had already cut out the papers before I went looking for a spring flower stamp. All my daffodils were too large or too small. The Easter lilies would have been murder to fussy cut. The flower that had a matching die was so busy it looked washed out on the card no matter how dark I inked the stamp. I searched through my binder where I categorize all my stamps and finally decided only the calla lily would work. It was only after they were all colored and cut, when I went looking for a stamp for the inside, that I found my new tulip that I had put away without stamping it in my binder, gasp. It would have been perfect if I had not forgotten I had it. So as my sister said, I just used the 'wrong' kind of lily. Is there such a thing as too many stamps?? Well, I leave you with this Stampin Up sentiment that I used inside the card: May the miracle of Easter bring renewed hope and peace to your life. Just got your pretty card in the mail! Didn't even occur to me that they might be the "wrong" kind of flowers. 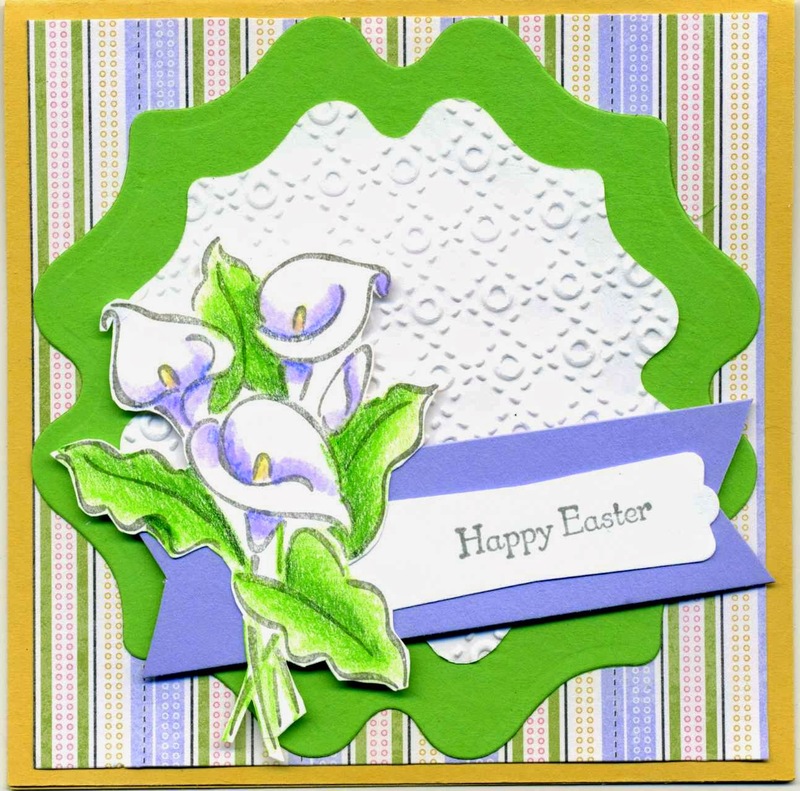 You colored them so beautifully in spring colors that they look perfect on an Easter card! Good question if there is such a thing as too many stamps... Sometimes I feel overwhelmed by all my stuff but who can resist all those tempting supplies out there. So maybe there is no such thing as too many stamps but there is definitely such a thing as TOO LITTLE TIME!! !